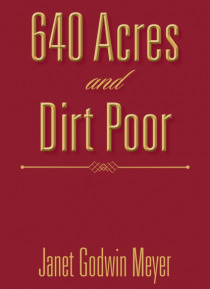 I, Janet Godwin Meyer, grew up on a dirt road in Georgia in the 1950s. My grandparents lived just across the state line in Alabama. Until I was eight years old, I had no idea that our black neighbors (the Collins family) were constantly reminded that they were second-class citizens. My parents accepted the Collins family as true friends who could be relied on to help and love their neighbors. … My daddy was strong-willed and independent in his constant support of all our black friends. Shut Godwin helped many whites and blacks, and his reputation as a force to be reckoned with actually made the Ku Klux Klan back away from any sort of witch hunts. And many times over the years, he redirected the evildoers that he called the KKK cowards dressed up in white ghost costumes. When I was ten years old, my mother drove her children across the country so that we could spend the summer in Magdalena, New Mexico. That was the closest we could get to my daddys sawmill. For fifty cents an acre paid to the federal government, my dad purchased the right to cut timber from the national forest.